Start this lesson by praying; expressing your need of His help and provision in this time of your life. Express thankfulness, gratefulness and worship Him for all the good things you know He does for you now, and those secret things you don’t know about. Note: Lessons 1-9 are required to achieve the Kingdom Seeker level. Once completed you will receive your first badge leading toward the next level in the www.masters21day.com online course. 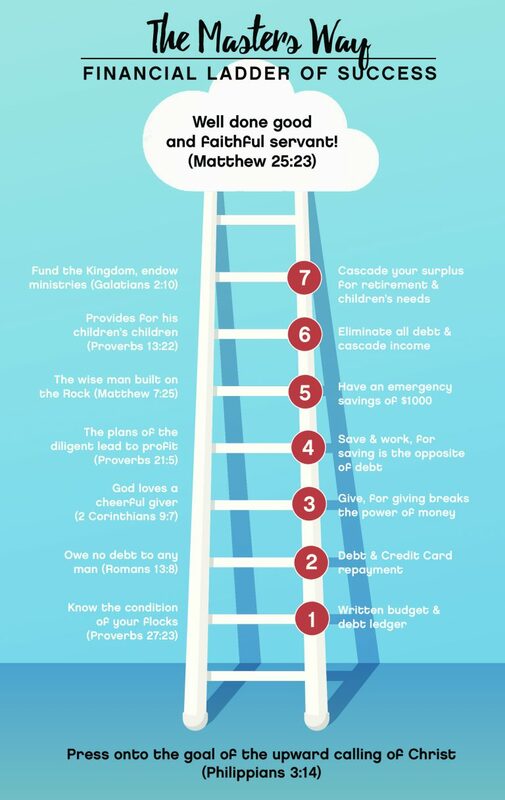 God is very interested in using our finances to help in communication, trust and personal commitment to do things right. It’s so tempting for one or the other spouse to perceive they are the more spiritual, often rationalizing by concealing gifts or other benevolent acts, only to be found out later. At this, the marriage trust meter hits bottom and nobody wins in such a situation. It’s far better to knuckle down and be honest in every area as someday when the trust chips are really down, true integrity will prevail and you as a couple will win and God will richly bless you both in this, though in the short term you may feel it was the right thing to do at the time. Learn this – a hidden act in the short term is not worth the long-term price of trust. Relationship Lesson #1: Be accountable to one another. As the saying goes: Forgiveness given, Trust earned, Reconciliation requires Trust. Integrity is a daily made habit and requires practice. No compromise allowed, understanding such requires practice and grace from both parties. Make complete honesty your new habit #1! Relationship Lesson #1: Be accountable to one another. As the saying goes: Forgiveness given, Trust earned, Reconciliation requires Trust. Does this sound familiar? Once you discover the secret of His Way of guiding your financial decisions, He will then and only then unleash His power and provision in this realm. Doing things the opposite binds God’s ability to help us. “Test Me in this” His Word states in Malachi 3. Why throw away His promise? It’s up to you! Once a Pastor called and asked to meet with us privately. This couple had faithfully served the Lord for years, was raising a great family and doing their best in every way. The only problem was they were overboard in debt basically to keep up with appearances. They were doing a great job fooling everyone but God, and now they were out of options. Upon disclosure, we found they had maxed out multiple credit cards, were burdened with two different car loans, had not only a large mortgage but a furniture loan and were now facing high health insurance premiums, all on a meager Pastors income. Further, they were also dealing with a very frugal church board that was saving for a new building. In addition, they were hoping to send their three children to a Christian private school, but now didn’t know if they could even save their home! At this, the wife broke down in hopeless tears. No way out it seemed. We told them; “God is our deliverer, if He did it for us, he will do it for you.” I said it won’t make any sense in some ways, but do your part and God may amaze you when He starts doing His. We told them; “now start with this budget and debt retirement plan, start doing the right thing one day at a time and we will be praying with you.” We all prayed together and they left slightly encouraged, knowing that at least they had come clean before the Lord in this matter. They dove into the paperwork. Soon after this Pastor pulled me aside at church whispering, “it’s crazy, but a check came in the mail in the exact amount we needed to pay off our second car!” Miracle #1. Next, as the wife had been working on her Master’s degree in teaching, she had achieved her degree early and then also miraculously a job opening came at the very school they were hoping for their kids to attend! She applied, got hired and presto, all three children were enrolled tuition-free as an employee benefit… Miracle #2. This went on. One day over a year later they got a call from her parents offering them an all expenses paid (w/o kids) trip back to her home town for a visit. “Wonderful” they thought, another unexplained blessing! Turns out, it was far more wonderful a blessing then they could ever imagine! After they arrived, her parents sat them down for a serious chat. At first, they didn’t know what it was all about. Then at the breakfast table, her father slipped an envelope across to them saying; “you know kids, we’ve been a little concerned about your spending habits last few years, but lately we’ve been very impressed with the turn around you two have taken doing this budget stuff. We thought this might help you along.” They opened the envelope and inside found a check for; (drum roll)…$250,000! The parents explained that they wanted ½ to go for their grandkids future college educations; use of the rest was up to them. With this wonderful windfall, (more on windfalls will be discussed later) and with their newly acquired spending and saving habits, they paid off car #2, their last bills and their home! They were now 100% debt free, and in how long? 18 months! They had been responsible in a small thing and so proving to the Lord they could now handle more responsibility, and God had blessed.